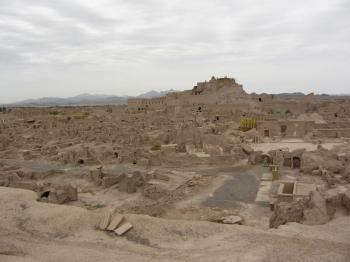 Bam and its Cultural Landscape is an outstanding example of a medieval Central Asian trading settlement in a desert environment. The survival of the town is the result of an elaborate underground water mangement system (the qanâts). They are still in use today, together with their supporting social system. 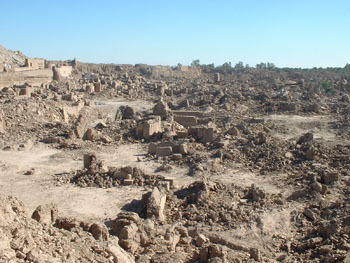 The site consists of a fortified mud-brick citadel (Arg-e Bam) with part of the old town within its walls, and the surrounding countryside including other settlements and medieval structures such as mausolea. Bam was almost completely destroyed in an earthquake on December 26, 2003. The quake had a magnitude of 6.6 on the Richter scale. The curious thing with the Arg-e Bam is that I feel it was inscribed precisely in response to the loss of any potential Outstanding Universal Value it may have had. By all accounts it was very impressive prior to the 2003 earthquake which obliterated it and the surrounding town of Bam, but in its current state, it really is not particularly exciting. Actually, this assessment is probably too harsh, given many sites in worse states of repair are considered worthy; while the OUV may well still exist, its allure as a destination worth travelling to is now in question. While the area around Bam is subject to various governmental travel warnings, it did not feel hugely different from elsewhere in Iran, apart from a police checkpoint along the highway. I visited with a taxi directly from Kerman, and thus avoided having to walk through the town of Bam itself, which admittedly did feel a bit more ‘frontier’ than elsewhere (this is probably simply because a lot of buildings aren’t quite rebuilt after the earthquake), but the site itself was perfectly fine. A guard noted my nationality in his notebook as I arrived, with the usual surprise at the response of ‘Australian’. Luckily this was not one of the multiple times this has been misheard as ‘Israeli’. The arg was filled with various Iranian tourists, including a school group, and the omnipresent phenomenon of the Italian tour group. Disappointingly, the main citadel is unable to be climbed, with access prevented past the courtyard at its base. The rest of the city is basically completely ruined; foundations up to waist height, with occasional walls and roofs of buildings deemed worthy of restoration. You would have to be very enthused by mudbrick to get excited by the remains. I had hoped to see active restoration in progress during my visit, but this was unfortunately not the case. The peculiar highlight of the visit was a video in Farsi playing on loop in the gift shop. Running for 18 minutes, it shows footage of the arg before the earthquake, cheesy animation of it collapsing, and footage of the immediate aftermath. The shop attendant eventually stopped it, and tried to sell me an English language copy. The visit was saved, however, by following the lead of all the Iranian tourists, and ‘loosely’ interpreting which areas were off-limits. After I saw the guards react with complete indifference to others climbing over barriers to take selfies, I decided to climb the outer wall of the complex. It was not strictly prohibited, as a gate was open and an obviously-worn path existed, but it probably wasn’t really allowed. As expected, nobody cared, and the view was rather good of the arg and the surrounding palm plantations. The site itself seems very proud of its WHS status, as multiple signs bear the UNESCO symbol, and a rock at the entrance bears a plaque listing the entire summary of its inscription, including each criterion it is inscribed on. I do not think I have seen a similar monument, with such specificity, elsewhere in my travels. Mosque: The Bam citadel has two mosques, one is the Jame' Mosque and the other the Hazrat Mohammad (AS) Mosque. 32 Community Members have visited.